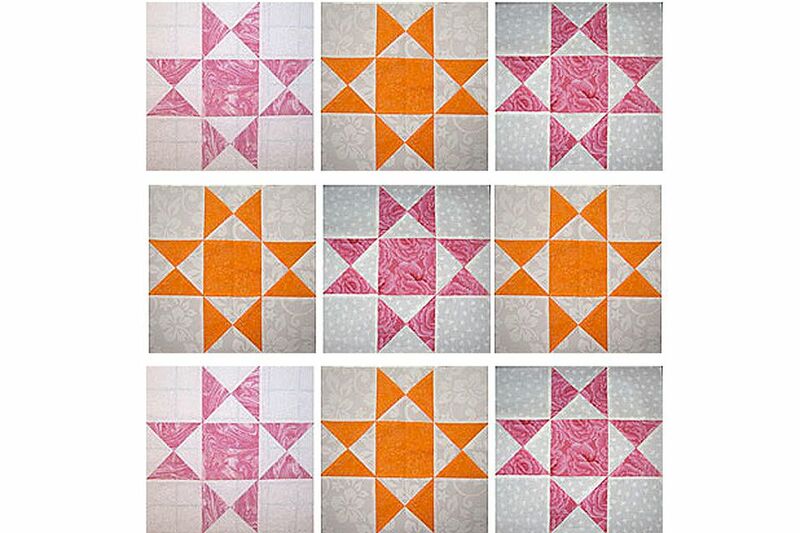 Try this Ohio Star quilt block pattern to sew 12" versions of the popular quilt block. The Ohio Star blocks illustrated are sewn with either pink or orange stars against a white-on-white fabric background -- called WOW for short. Select tone-on-tone fabrics for the stars. The color selection was originally used for a quilt block exchange but you can make the quilt blocks with any color combination that you like. Ohio Star is a nine-patch quilt block made with five plain squares and four quarter-square triangle units. It's a classic block that's easy to make, but do take care to sew an accurate quarter inch seam allowance when assembling the patchwork units. It's often best to cut the 5-1/4" parent squares listed below just a bit larger and then trim the resulting half square triangle units you produce to their exact unfinished size before turning them into quarter square units. Don't worry if this is a new technique for you -- the instructions on page 2 explain the process. Draw a diagonal line on the reverse side of each lightest 5-1/4" square. Combine a 5-1/4" x 5-1/4" pink (or orange) square with a WOW square of the same size, right sides together and all edges matched. Use a quick pieced half square triangle unit method to sew two half square triangles from the pair. When complete, each unit should measure 4-7/8" x 4-7/8". If you used larger than necessary squares, trim each unit back to that size. Repeat to make two more half square triangle units. Use the same basic technique to make four quarter-square triangle units but align units so that contrasting fabrics are not across from each other. The easy quarter square triangle instructions explain how to combine the parent half square triangle blocks. Each of the four completed quarter-square triangle units should measure 4-1/2" x 4-1/2". Arrange the plain squares and the quarter-square triangle units into three rows, taking care to orient the triangles as shown. Sew the components of each row together. Press seam allowances towards the plain squares unless you feel the color shows through too much. Sew the three rows together to complete the block, butting the seams and matching patch edges. Use straight pins to help keep fabrics from shifting. Press. The Ohio Star quilt block should measure 12-1/2" x 12-1/2". If your block is smaller than it should be, or skewed, press again and recheck. If it still isn't quite right, use my easy squaring-up method before swapping it with others or sewing it to other blocks. Try the easy Magic 8 method to assemble groups of eight identical half square triangle units to use as parents.